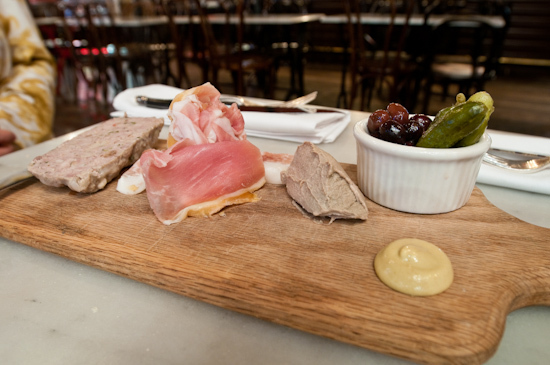 We went to Haddingtons for a media event where we sampled several items. We started off with a TLT - smoked tomato, brun-ostoo cheese, lettuce & truffle aioli which I didn't photograph because I ate it standing up. It was delicious and Tina's favorite. 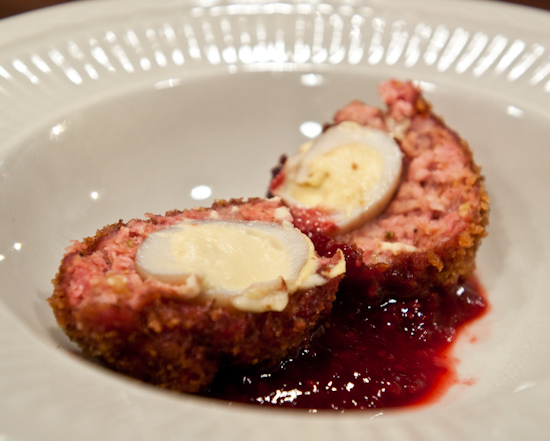 Scotch Eggs pickled quail eggs in sausage. 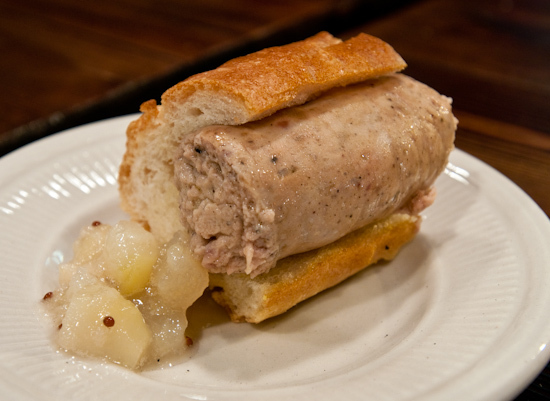 Foie Link house made foie sausage with pear relish. The filling was mushier than a weisswurst. Tina didn't like the texture and I felt that it would have been better if it was firmer since the casing was relatively difficult to chew through. Otherwise, I really liked the sausage and thought it was well paired with the relish. 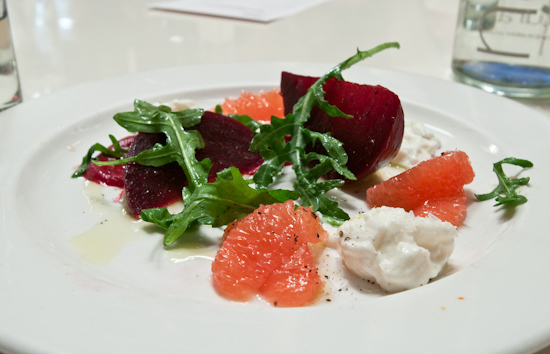 I was lucky enough to be invited to a grapefruit themed dinner hosted by TexaSweet Citrus (a non-profit corporation that promotes fresh citrus fruits grown in Texas) at FINO Restaurant. 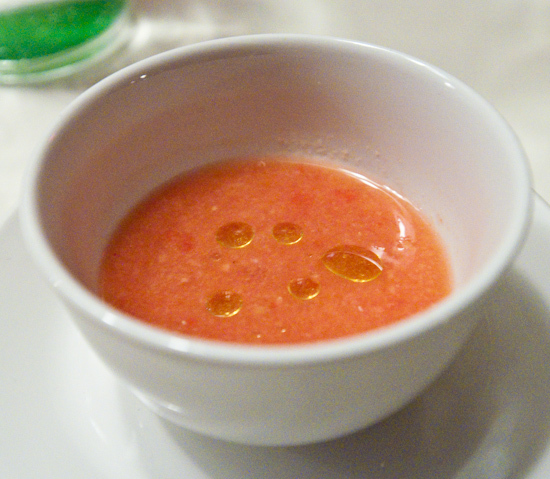 Each of our courses featured Rio Star Grapefruit (which happens to be my favorite - I had two on my kitchen counter before going to the dinner… now I have six). Some had grapefruit as more of a garnish (the lamb) while others were subtle but added a whole new dimension to the dish (hamachi crudo which was cured in a grapefruit juice brine); all were delicious. We had an 8:45pm reservation at Congress and when we arrived our table wasn't ready yet (the previous party had not left). They had a small table in the bar reserved for us to wait at, so we sat down and ordered sparkling water. We had the choice between Topo Chico and Tynant, so we chose Tynant - a sparkling water from Wales with relatively large, crisp bubbles but not overly acidic or metallic (the water worked quite well with our meal and we ordered a second bottle while dining). We were hungry, so we ordered the Burrata - Oxtail Marmalade - Buttered Brioche ($12) from the bar menu (which I think is serviced by the 2nd Bar kitchen because it was brought over from the door leading to 2nd Bar). 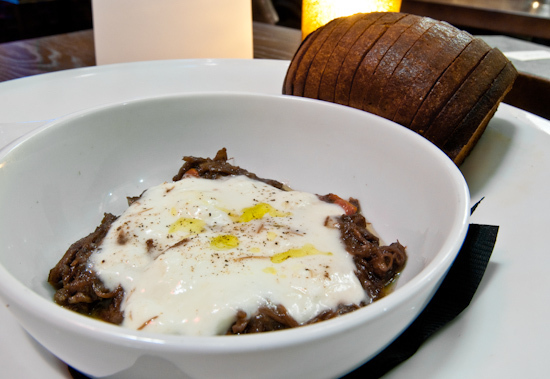 The creamy mozzarella, sweet oxtail, and drops of fruity olive oil made an excellent appetizer which we lathered over the soft, fluffy bread.